My name is Matt Hodgson and I am based in Brighton UK. I have a very small kennel consisting of 2 Alaskan Malamutes and two Canadian Eskimo Dogs. 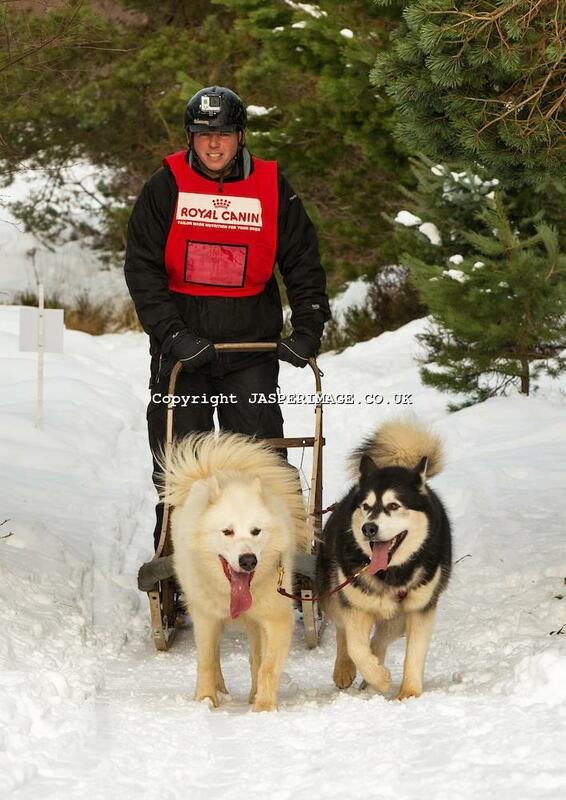 I have been involved in sled dog racing for about 12 years now, mainly dryland mushing at various rallies around the UK, I have also run dogs in Arctic Sweden on recreational trips. What introduced you to dog mushing? I have been a big fan of Northern Breed dogs since I was a boy and read books such as Call of the Wild by Jack London. When I was finally in a position to start looking at dogs my first desire was a “Husky” after a bit of research I discovered a breed called the Alaskan Malamute, at the time due to quarantine restrictions at the time this was still a rare breed in the UK. After joining various forums and groups I discovered there was a thriving racing scene in the UK, after making contact with someone planning a litter I was invited to a rally to meet the dogs and see them in action so I fully understood (or as much as you can) what I was potentially letting myself in to with the breed. My first real experience of running a team of dogs was on a trip to Kiruna in Northern Sweden where I spent a weekend of running a tour team of Siberians around the area with a guide and staying in cabins. It was a thoroughly immersive experience including drilling through the lake ice to haul water up to make the dogs food and some of the basic tasks required on a day to day basis, which we take for granted in the modern world. I remember the most amazing thing was how quiet everything was when covered in a thick layer of snow. Describe the dogs on your team. My current team consists of Invi and Ira half brother and sister registered Canadian Eskimo Dogs. Many of the classes in Europe are only open to registered sled dog breeds, this is to try and promote the purity of dogs lineage and discourage the cross breeding simply for faster dogs. While there is nothing wrong with this for those who choose that route I, like many others are in it for the breed rather than the speed. My dogs share a sire who was imported to the UK from Baffin Island Canada, his father holds the record for the dog who has been to the North Pole more than any dog in history, their lineage is that of true polar dogs, however they are great in a modern environment providing they get enough stimulation, there recall is pretty good for an arctic dog and their manners when not over stimulated are impeccable. I can lend them out with confidence to runners in canicross groups knowing they will behave with other dogs, this is definitely an improvement on the malamutes ive had in the past. What about them do you enjoy the most? I love their crazy natures, while intelligent they can also act like complete goons and the bond they share is unlike anything I have seen before from the first time they were introduced they have bene virtually inseparable. Its hard to train in the UK as the temp and humidity mean its often never really cold enough to push the dogs. However it is also rarely hot, so you can exercise the dogs year round with caution. I tend to mix up training sometimes canicrossing (me running with the dogs strapped to me) up to 5-6 miles once a week then a few sprint runs in the week of 2-3 miles on wheels. Typically races I enter are 2-3 miles long so the time on the trail is very short, however we have completed longer runs with the longest being 52 miles in a 24 hour period, this was pretty tough on such a small team especially over very muddy terrain at time. I generally do harness work year round with maybe only a couple of months off in the height of summer, having a small kennel means its fairly easy to let the dogs revert to pet dogs with walks in the countryside (away from sheep) my girls enjoy paddle boarding as well from time to time. Earlier this year I competed at the WSA European Sleddog Championship in Inzell Germany, it was my first time competing on snow. It was an amazing experience, with hundreds of competitors from across Europe taking part, a full opening ceremony and parade of nations made the whole experience very special, everything was awesome except my ability to use a racing sled. Enjoy your dogs, don’t lose the fact the dogs are your buddies and if you want them to perform for you, you need to work with them to understand their triggers and drivers. I think too many people just drag their dogs out of the kennel or off the couch and just expect them to run. Checking and treating for niggles and injuries is important as is keeping the dog happy and motivated, ive recently started having my dogs treated with Galen Myotherapy, GALEN myotherapy is a hands on muscle manipulation therapy. GALEN myotherapy maximises muscle function in fit sporting dogs as well as those who are lame or have chronic pain.